I’m excited to share a little project that I’m involved with at Liquid Church of New Jersey — through which we’re hopeing to bring a little joy to the world this Christmas Eve. How about by organizing the world’s first virtual Christmas choir made up of singers from around the world wide web. Whether they’re soldiers in the Middle East, moms in Estonia or students in Phoenix, Arizona, the church will leverage technology to synchronize individual singers into a unified choir rendition of Silent Night. The sermon message for Christmas eve will touch upon how the body of Christ can come together as one voice. And so this project is a nice tie-in to the message while providing something fresh at Christmas. The project actually arose from the fact that Liquid not only has over 2,000 people who attend our church services each week, but thousands more come to church online or download any of the hundreds of podcast files each month. One question that we asked ourselves was: How do we increase interactivity and sharability at the same time? Well, a guy named Eric Whitacre recently presented at TED about a virtual choir he assembled by harnessing the connectivity of the web. And in a simliar way, we decided to ask our people at our campuses and across the web to help spread the Christmas cheer together this year with us by getting involved. Singers are given access to sheet music, music tracks and a video-recorded conductor so that anyone can record and upload their contribution to YouTube. Liquid Church’s media team will then assemble a composite video production that integrates all of the individual videos into one large-scale synchronized video rendering for the Christmas Virtual Choir. The deadline for those who want to participate in the choir is December 15th. Instructions are available at http://www.lqd.ch/xmasvideo. The Christmas Virtual Choir’s performance will occur at six live Christmas Eve services in New Jersey on December 24th held by Liquid Church as well as church online services that weekend. Perhaps the Protestants *do* have something learn from the Vatican even after breaking away a long time ago. First Pope Benedict XVI said to his troops, go ahead and blog away! If you’re a Pope that’s hip with YouTube, you’re obviously already on Facebook. And what ultra-hip clergy would be without his own Pope Iphone App? Every year, over 1 million of the 5 million people in Costa Rica make a yearly pilgrimage to the Nuestra Señora de los Angeles Basilica in Cartago. But with H1N1 making the rounds, the country’s top health official banned the pilgrimage last year. What did the Catholic Church do? Nope, they didn’t protest (well, of course they did a little). But instead, they embraced technology and launched www.romeriavirtual.com to that hundreds of thousands could still participate in the 288 year old religious ritual — and still do it in community. The H1N1 threat has subsided enough that the offline pilgrimage is back on this year, but what’s happened is that a virtual version has been birthed and will continue as this new tradition evolves and becomes part of the annual rite now involving participants from around the world. You might say that, faith really does have no boundaries — at least in this case! Tonight I teleported over to the 1st Presbyterian Church of Second Life and joined a prayer gathering in the virtual world. I’ve done church online, video chats, tokbox multi-user web conf prayer meetings, I’ve even been to LifeChurch.tv in Second Life before. But this Second Life virtual reality prayer meeting was a first for me today. 10 people stopped by this evening as we gathered in a taize-style prayer mini-service in a circle of comfy (looking at least) floor cushions. Here’s my first thoughts as I left the meeting tonight. The technology seems to still get in the way of the experience. Aside from voice chat not working for some members tonight, the learning curve for navigation, gestures, audio-visual control, group chat, messaging, etc is all a challenge for new comers. But if a church is to continuously attract new visitors, even in a virtual one, getting over the technical hurdles is one reality that needs to be addressed. Of course, if you are more versed (spend more time) in this virtual reality environment, it would become infinitely more transparent. Perhaps ministry volunteers are needed to monitor and guide new visitors through the experience just as in off-line churches. 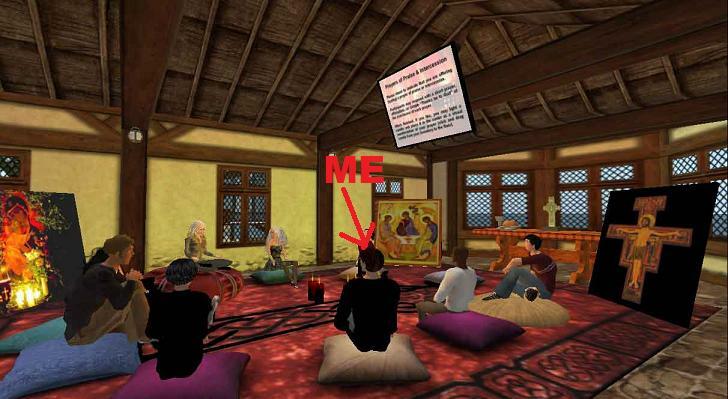 Perhaps more training can be offered via short videos or other methods on church websites, available before entering Second Life. I realized that viritual church and church online are two completely separate things. With church online such as www.lifechurch.tv or www.liquidchurch.com, the technology is basically transparent for most. You are not bogged down continuously being reminded of the technology interface you are using to connect with others. To give SL credit, I *was* handed a “newbie card” during the experience, which had some help notes to get me started on Second Life. But most of it would be more useful only sif I had a sherpa guide next to me helping to decipher and lead me through it all. Bottom line is: Virtual church on Second Life still has a way to go before it is ready for mainstream exposure. But in the meantime, digital explorers have found a place to roll up their sleeves and beat down a path for us for when we (and the technology) catches-up. America’s favorite pastor and his church is now officially mobile. 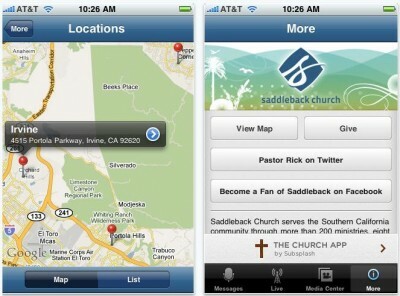 The Saddleback Church iPhone app has links to Twitter and Facebook to keep you connected with Rick Warren’s social media web. You can also view live streaming video of worship services at Saddleback Church. 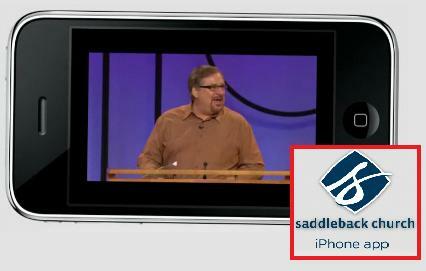 When you’re on the go, there’s also an easy menu of recent video sermon messages which you can watch on demand. 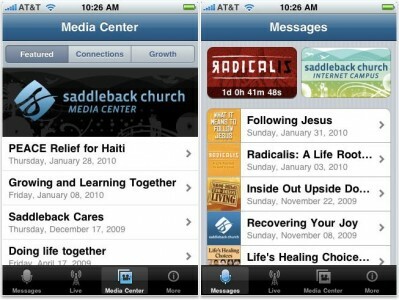 Just like the Gospel, the Saddleback iPhone app is free. Critics of church online all point to the sterility and breakdown of human connections across the digital highway. Stefana Broadbent, an anthropologist who has studied human relationships across technology (cell phones, IM, Skype / video chatting, Facebook, etc) for over 20 years, has come to a different conclusion. While you watch this video of her presentation on how the Internet and technology actually increases intimacy in human relationships, you’ll find the eerie Dunbar number coming up (120-150!). 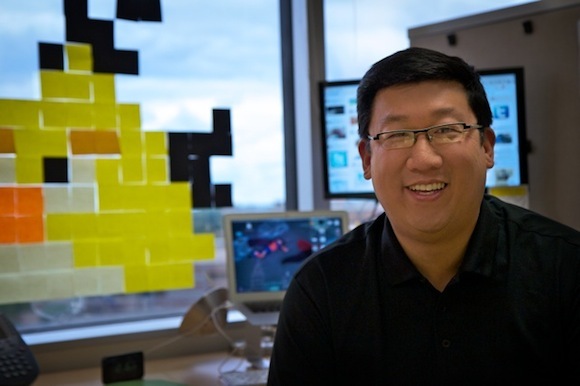 Technology hasn’t drastically increased the number of real connections we manage online – humans are in the end humans. But of course there’s a little twist. . .
Did you notice the typical number of people each person connects with in close relationship (80%…___ intense relationships) when using technology mediums? Surprising? No? 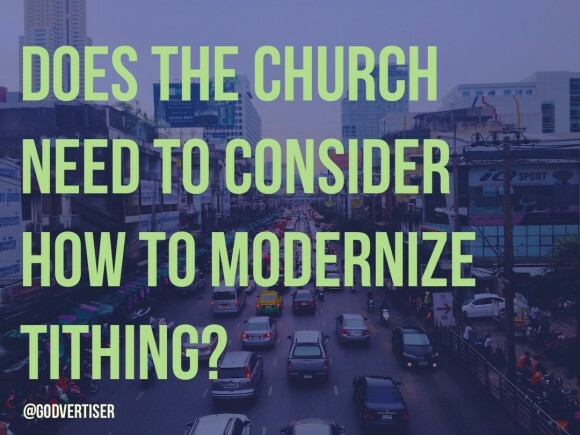 Broadbent’s findings can have real implications for how church online approach and use technology to communicate and connect its people. But this learning isn’t just applicable to digital worship communities trying to build out complete online church experiences. Technology won’t just by default destroy or degrade intimacy in relationships — it can actually leap across distance and social/cultural structures (like workplace rules) to enhance and build relationships where offline just can’t compete. The presentation in this video is an interesting data point when thinking about how to approach the use of social media by pastors and churches.